norament satura rubber flooring has a flexible palette of 32 muted neutrals and saturated accent colors. 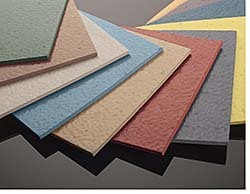 Has a static coefficient of friction of .99 (.95 wet), and sound absorption properties. With a thickness of around 3.5 mm, it resists wear abrasion and withstands heavy wheeled traffic up to 850 psi rolling load.